It is hard to believe, but I definitely have more trouble finding time for writing now then before I left my full time job. Our little cooking school suddenly makes me even busier. But I'm still determined to keep writing whatever happens, this time - about fried rice. I always liked the whole idea of fried rice, which is to take some sad leftover rice out of your fridge (or even freezer) and give it a completely new life. 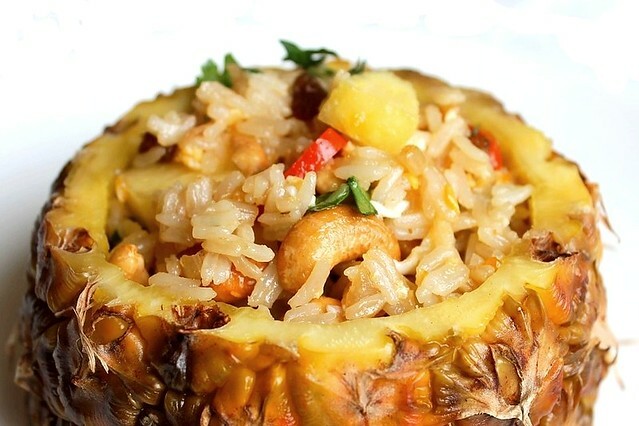 Now I mostly cook fried rice thai style and this pineapple version is one of my favorites. This dish was definitely around, when I was in Thailand. Both in Bangkok and on little islands. 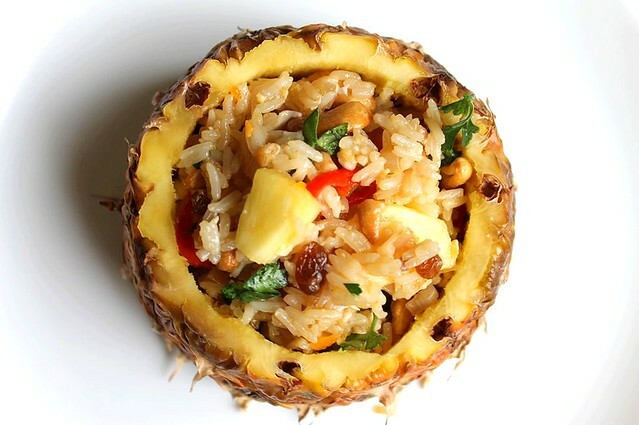 Mostly served in an emptied pineapple, with fresh pineapple chunks. Sometimes it is vegetarian, sometimes - with chicken or shrimps. Very often they add cashews, sultanas, all-time spring onion and that hint of fish sauce, which instantly makes it taste thai. The thing about fried rice in many Asian countries is that the rice has to be leftover. If you are cooking rice especially to make fried rice, you need to do this in advance, cool it completely and let it sit in the fridge (or freezer) for at least few hours. Due to this chilling the rice becomes much firmer and fries beautifully. If you fry it right after steaming it goes too soft, absorbs however much oil you add, sticks to the pan and so forth. If you get this right, fried rice is very easy to make and delicious. This thaifoodmaster video gives a very good idea of how to fry rice thai style. Also to me, fresh pineapple makes a real difference here, so it is very much worth trying and not substituting it for canned pineapple. There are several ways to go about making a pretty pineapple bowl if you would like to serve the rice in it. My favorite one yields a bottom-less bowl and is very simple. Cut off top and bottom of your pineapple, then cut the pineapple in half across (so you have two thick wheels). Choose the half you like more and place it on a cutting board larger cut side down. Insert a long narrow knife into the flesh 1.5 cm from the skin and push it through, till it comes out from the other side of the pineapple. Run it around and take a cylinder of flesh out. The bowl is ready. To prepare the flesh, halve the cylinder lengthwise, cut out the hard middle and chop the flesh into 1.5 cm chunks. Place the rice in a heavy base pan. Add 3 cups of water, bring to the boil, reduce the heat to low, put the lid on and cook for 12 minutes. Turn the heat off and leave the pan on the hot stove, lid on, for 12 more minutes. Flake the rice with a fork and chill in the fridge for at least 2 hours, better overnight. In a small frying pan heat 2 table spoons of vegetable oil. Add the eggs and cook on low heat, stirring gently to make still wet scrambled eggs. Transfer to a plate and set aside. In a small bowl mix together all ingredients of the stir-fry sauce. It is easier to fry not more than 3 servings in one go. Set a wok or a wide frying pan over medium heat. Add 2-3 table spoons of vegetable oil. When hot add the shallots, garlic, chilli and white part of spring onions. Cook stirring till the shallots are translucent. Do not let the vegetables brown. Pour in the stir-fry sauce and cook stirring till it bubbles. Add the rice and press it down into the sauce with a spatula. Then stir and press down again. Cook, stirring and pressing down till all the sauce is absorbed and there are no white rice grains any more. Add the eggs into the rice, cut them into rough pieces with your spatula and mix them in. Mix in the sultanas and cashews. Off the heat mix in the pinapple chunks, green part of spring onions and coriander leaves. Serve hot. Tom yam kung. Home made. I'm making this tomorrow. can't wait!